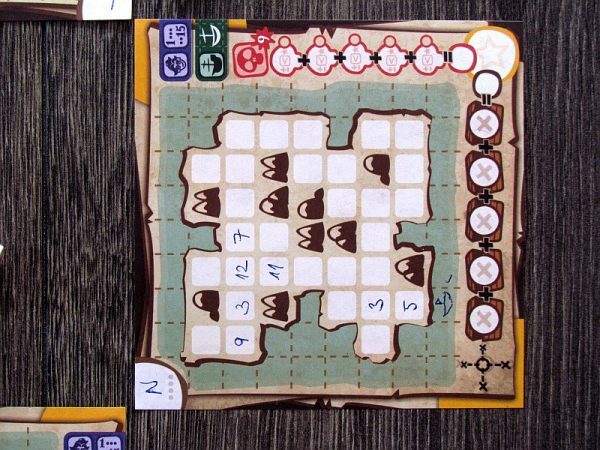 Review: Sushi Go Party! - and it's sushi time again! It’s just a story. The spoken word has a very limited lifetime and information passed on like this is significantly lower in both value and longevity. So its better to draw a map. This, by contrast, is the most valuable thing you can create from each story. Such a plan would be wanted by everyone. Desired, but only chosen one can win the treasure. Drawing maps of islands full of treasures has been found an entertaining profession by designer Henri Kermarrec, who created it in Sit Down company production. 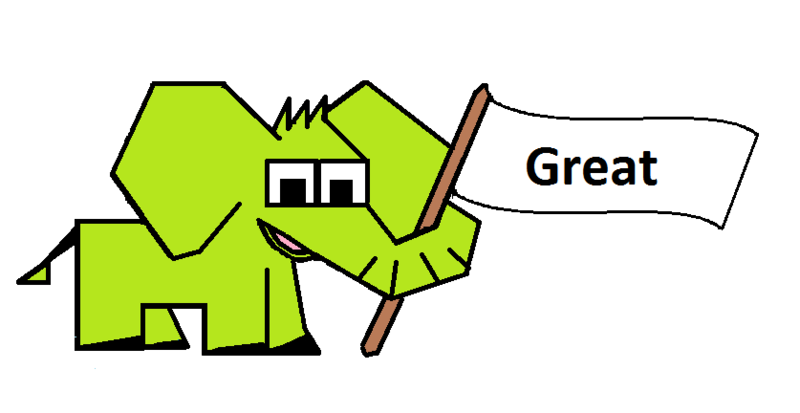 The game saw the light of the world in 2018, few simple illustrations were prepared by Géraud Soulié. 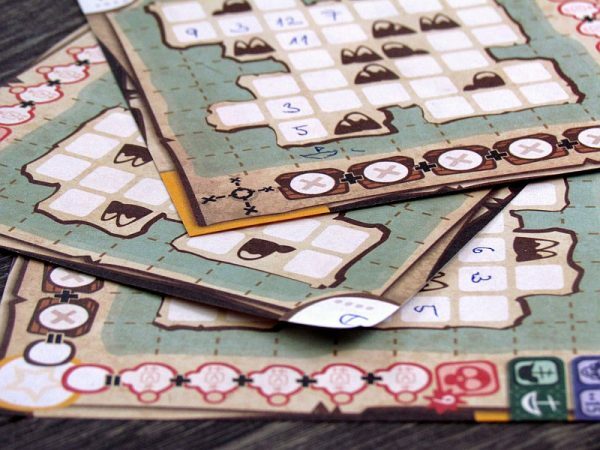 The whole box is distributed by Esdevium Games in Europe. Just three dice and a piece of paper. That’s all you need for an experience on the horrible island of skulls. Even the lid with the adventurous view of the treasure does not promise anything more. 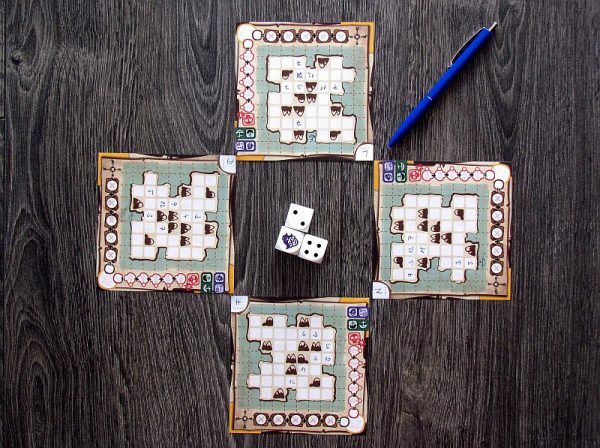 Each player takes one sheet from the notepad, finds a pencil (not part of the box), while the dice are placed in the center of the table. 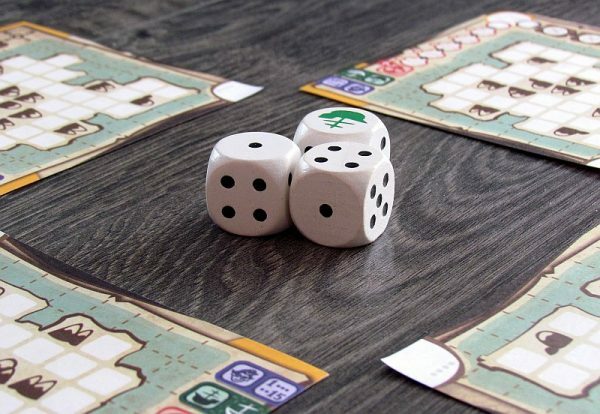 At the beginning of each round, all that needs to be done is to roll a trio of dice and their result will determine everything, that will happens. Players can choose if they want to add values of the two or three dice or use a single digit. 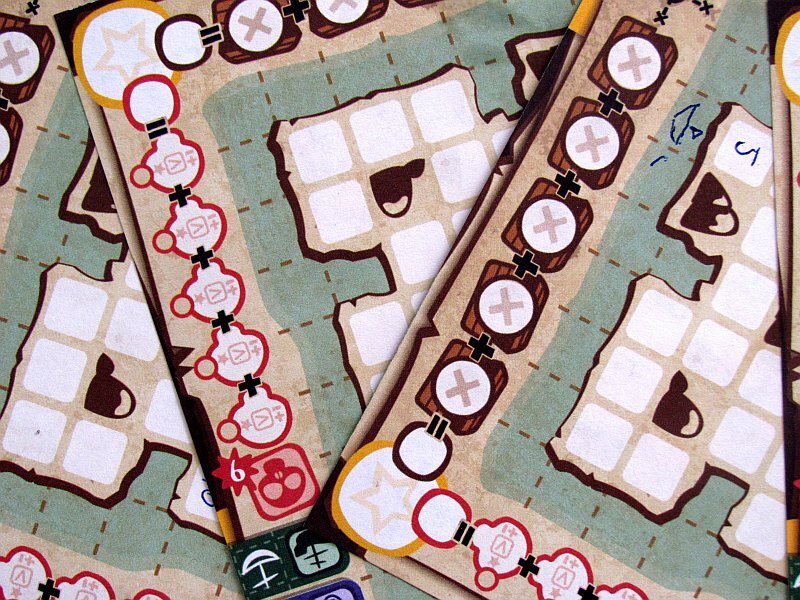 This chosen result has to be written by each of the participants in their own treasure map. First field is landing point on the island, so the number must be typed into any coastal square. All other written numbers must be adjacent to one of the digits already written. These results are not just numbers. They can become coordinates or at least their part. Only when the player manages to create a target from four equal values (two in a row and two in a column, treasure is in a spot, where these line cross), they can mark this space by a crosshair. At the same time, they pick up treasure, that is just as valuable as the quartet of same numbers. This result is recorded by the player in the score line at the bottom of the sheet. But pips are not everything, that can be found on dice. There are also three icons on offer – head symbol (female character Penny Papers) acts as a joker. Players can now select any number from one to fifteen in this round and write it according to the rules as they like in their map. 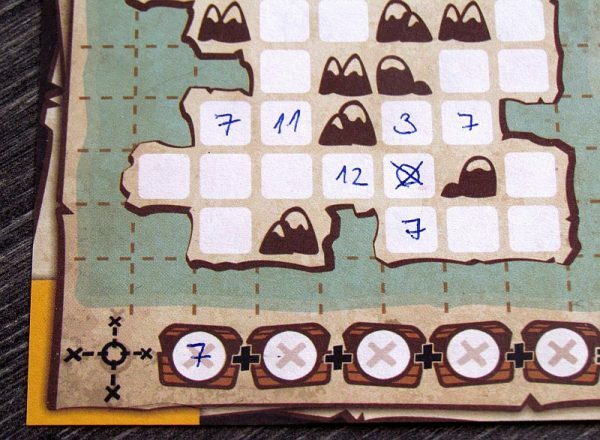 Boat icon offer a choice (but players can still write down the value of the two remaining cubes – single or sum) to draw a silhouette of the ship in the water surface surrounding the island. That’s where Penny is waiting for more adventurous Dakota Smith. At the same time, ship can in future rounds replace any one of the co-ordinates in the treasure hunt. Last symbol on dice is a skull, that completely eliminates the results of two other dice for that round. This is because players now have the ability to influence success of their opponents. 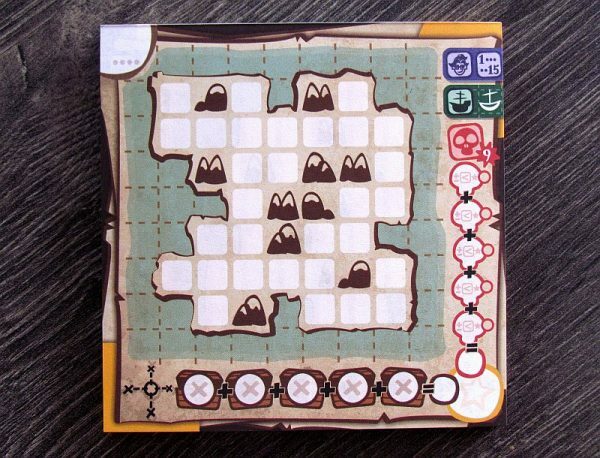 They can take sheet from any opponent and draw one skull on surface of their island. 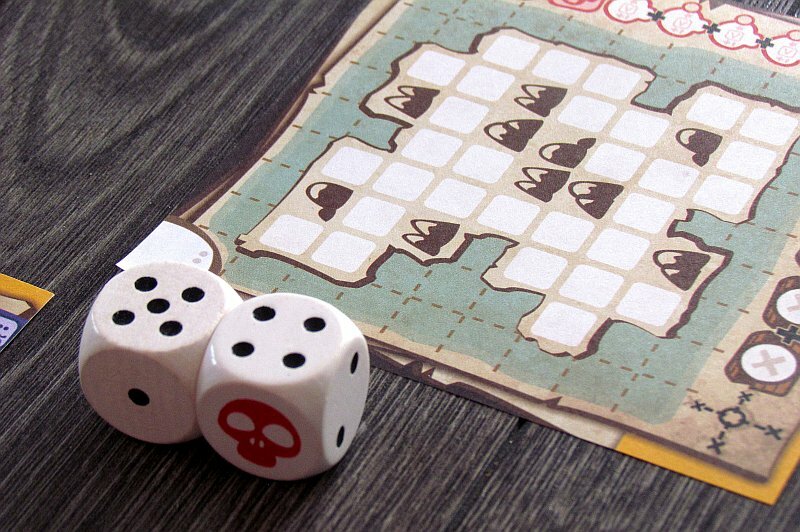 There can be up to five skulls in the game (more are ignored), as the players progressively mark them, when rolled. 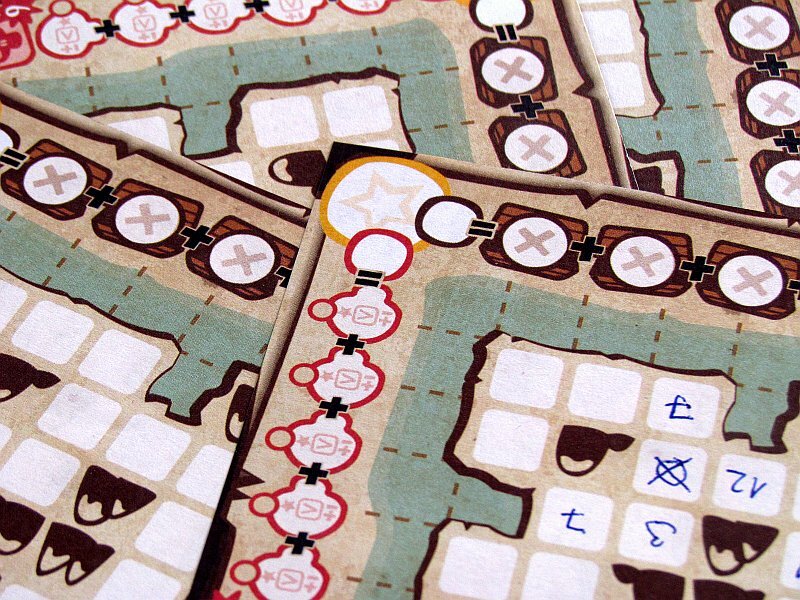 If they remain not disarmed on the map until the end of the game, they will transform into minus points. The pirate symbol can only be discarded by placing number nine in its immediate neighborhood. From that moment, the negative penalty changes to same number of points. 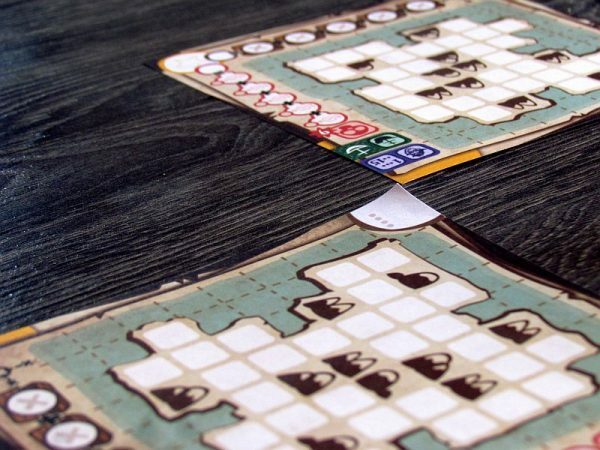 Game ends when the islands are finished or when one of the successful treasure hunters finds a fifth buried treasure. 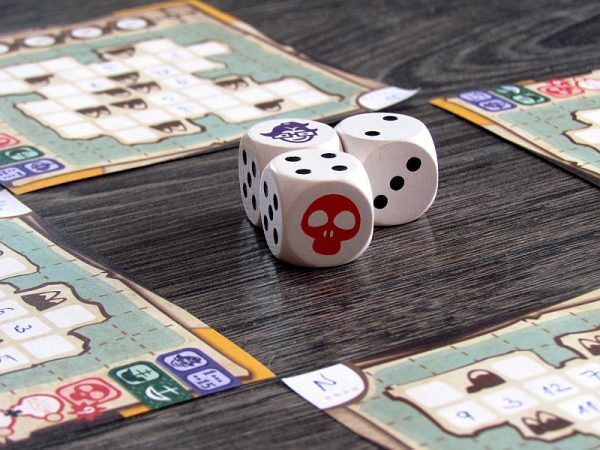 In either case, the players will sum up points from treasures found and from skulls (plus and minus), and the one who has the most valuable prizes as a result will become the winner of the entire race. Penny Papers Adventures: Skull Island is a game that looks terribly simple. Just pencil, paper, dice and your skills. And it really is very good to deceive, because putting the numbers smartly and conveniently is not easy at all. It is not possible to write them arbitrarily, but only to the neighborhood as the explored area of the island expands. An exception is the addition of ships that the player can use as their new starting point in the later stages of the game. But, in addition to tactics and planning, there is absolutely some luck. 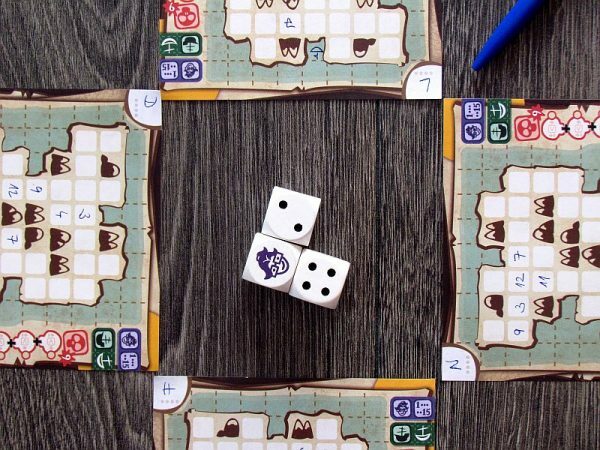 Rolling three dice is really pure luck but at the same time the ability to add their results together means, that players always have a choice of more values in their turn. And those can be even smaller than six, although the lowest numbers seem uninteresting. Noone wants a treasure chest of price two. Or maybe they do? And can it be the way to victory? It can also be true if you are well timed and quick. The game would be very dull with only the digits and the dice rolls. 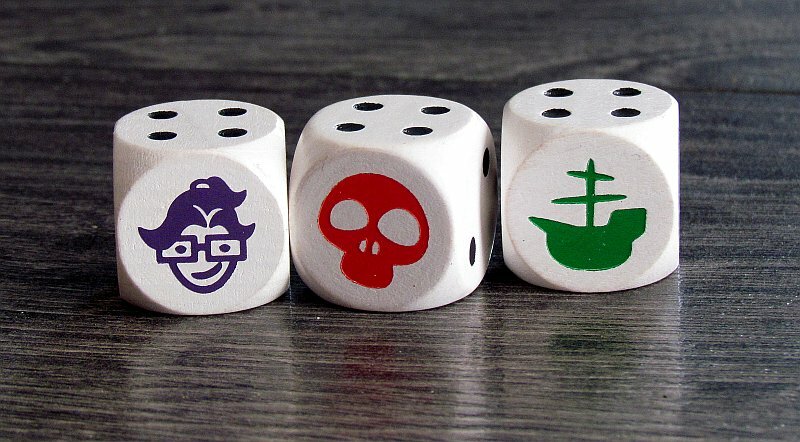 Fortunately, the symbols on dice change it all – each has one icon and five numbers (from one to five). The maximum rolled as the sum can therefore be fifteen (3×5), which also equals to the value of the most valuable treasure in the game. But getting four fifteen or connecting them to the ship so the player finds that treasure really needs a lot of experience. Game is not only simple but also fast. It takes only about a quarter of a hour. This is because everyone plays the dice at the same time. Additionally, top limitation of the participants virtually does not exist, as indicated by the number 100 on the box. Likewise, two opponents can easily play the game and still get good fun. In more rivals, fun is mainly, when the skull is rolled. They all have a chance to fight then. Although the game with symbols and graphics is trying to attack some theme feeling, this is unnecessary. The atmosphere is simply not even possible, because players count the values from the dice and write them down in their maps. So simple it all is at the bottom line. And yet the very idea of locating treasures with four coordinates is great. Players get a variety of exciting ways to pick location and place values. This is the first box of the series, which, according to the information available, is at the same time the easiest. 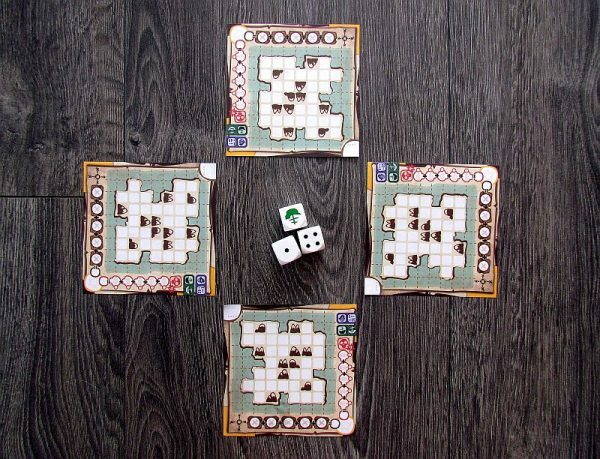 Perhaps we will get the chance to try the other two boxes, that exist at the moment and bear the names of Valley of Wiraqocha and Temple of Apikhabou. So far we have only one box in our office and we have to judge everything. Penny Papers Adventures: Skull Island is much more fun, than it looks. Processing can not be evaluated too much this time, although the leaf layout itself is good. In the upper left corner, there is even a place for initials so papers are not mixed, when drawing skulls. But to make it clear: Penny Paper is really the character, that is in the lead role of the whole story. You can imagine it. 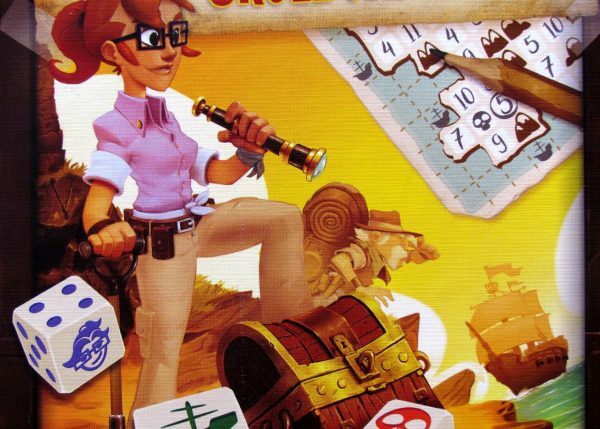 The only real problem is so totally addicted to luck and dice, but even so this game has a chance to fit alongside dice classics like Qwixx. 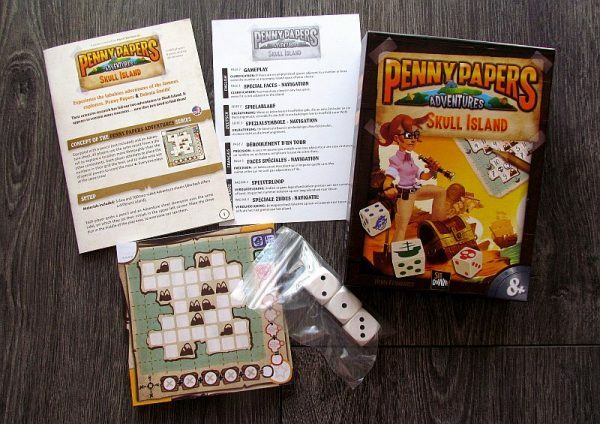 Penny Papers Adventures: Skull Island brings with it all the good from the dice games and everything you might want from such a game. Penny Papers Adventures: Skull Island is an elegant dice game, that offers players only dice. But the freedom to make the result and what to do with it is the place where the game becomes an instant classic. More of the same numbers over time must be placed, even if it wants a bit of luck. But when playe succeeds, he will create coordinates, that lead them to a valuable treasure! First, second to fifth, and all within minutes. 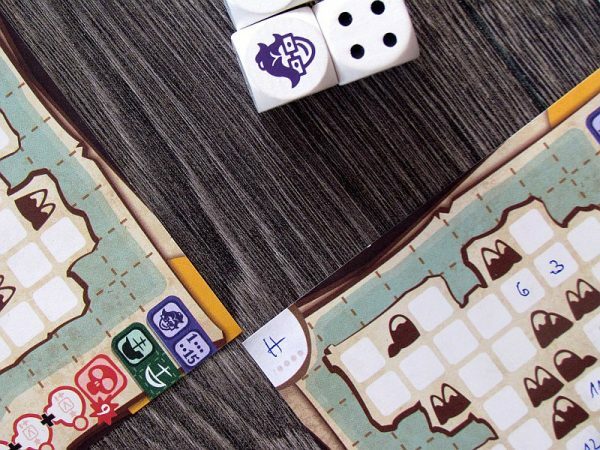 Penny Papers Adventures: Skull Island is an excellent dice game.